Top Kensington Cleaners is a cleaning company in Kensington W8 and our business is prospering. We care about our customers and we do everything we can to fulfil their requests and put a smile on their faces. Our intention is to help with cleaning. Generally, we have a bunch of cleaning options. We not only offer help with the domestic chores, but also with carpet cleaning, end of tenancy cleaning, spring cleaning, after builders cleaning, oven cleaning and upholstery cleaning. We provide effective solutions to your cleaning problems and we can assure you will be happy with the outcome. Have you got any questions? Please, continue reading. The cleaning services we offer in Kensington W8 include carpets, floors, kitchen appliances, upholstered furniture, etc. We also clean rented properties after lodgers move out. This service, which is called end of tenancy cleaning, is very helpful to both landlords and renters. Not to mention, we have deep cleaning. The difference between domestic cleaning and deep cleaning is that the latter is done in a more detailed way. Furthermore, we offer after builders cleaning. As its name implies, it is done after repairs or refurbishment within the property. There is usually heavy soiling and dirt left by builders. We can bring your home back to shine in just a few hours. We should also mention a few things about our cleaners. Before we let an employee work in customers’ homes, we always provide them with initial training. We also test their abilities and check their background. This is done for your peace of mind and satisfaction. All our cleaners have significant experience in cleaning and many specialties. They are skilled, good and professional. 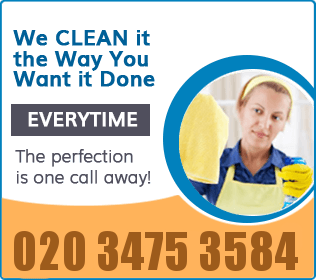 If you want to book our cleaning services in Kensington W8, no matter which option you need, just give us a call. We will answer within seconds. Get a free estimate.